On the 1st November 1750, Theodore Victor, aged 11, started his training as silversmith with his father. Theodore Everard van Berckel was a master silversmith and was entitled to employ apprentices. It was usual practice at the time for a guildmaster to teach the trade to his own sons. Two younger brothers, Rutger and Gijsbert were also apprenticed to their father. Neither of the boys would later persist with the trade. About Rutger we know no more than that he painted, amongst others, the portrait of Theodore Victor shown on the startpage of this site. He died in 1767 at less than 22 years of age. His brother Gijsbert became a priest, connected to the Sankt-Victor Stift in Xanten (Germany). He died at the ripe old age of 87. A further brother was not considered for the trade at all. Petrus Josephus van Berckel was apparently a very good student. He attended the Latin School, later became a physician and made a career as a city councillor. In 1807 he was installed by Louis Napoleon, King of Holland, as the first Mayor of 's-Hertogenbosch. Registration of Th.Victor as apprentice silversmith. The engraver Johann Conrad Marmé, from Cleves, North-Rhine Westfalia, Germany, later on also featured. Marmé, who originated from Fulda, established himself in Cleves in 1741. He was employed there at the Royal Prussian Mint. Medal by Marmé from 1747 for the ‘Dutch’ market. By coincidence, a brother of Theodore Everard was connected, as canon, to the above mentioned abbey Sankt-Victor in Xanten. Cleves is about 20 Miles distance from there. Theodora van Meverden, mother of Theodore Everard, also originated from Xanten. It is likely that Marmé was put in touch with the Van Berckels from Den Bosch via relatives of Th.Everard or by mutual acquaintances. One may imagine that the Van Berckel family served as a springboard for Marmé in these parts. From 1741 onwards, Marmé produced various dies for city hall medals for Den Bosch and we also know of a city seal ‘Ad Legata’ by him. Later he received a number of commissions to produce medals from all over the country. 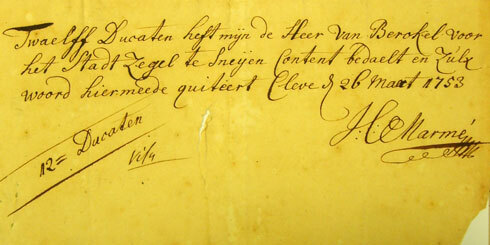 Marmé’s receipt for the seal ‘Ad Legata’ of 's-Hertogenbosch. When Th.Victor completed his apprenticeship as silversmith, his father sent him to Marmé in Cleves where he was introduced to the trade of engraver and die cutter. According to Hendrik Palier, the first biographer of ‘The three generations Van Berckel’ in about 1830, Van Berckel senior paid 700 guilders for the training of his son. The boy enjoyed board and lodging with the Marmé family as he was taught his trade within one year. 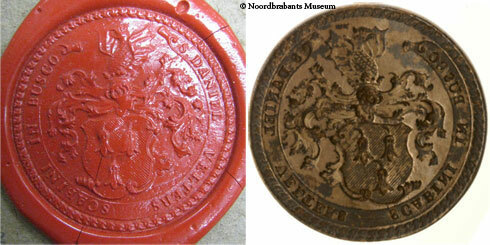 In 1757 Marmé moved to Utrecht where he became a die cutter at the Provincial Mint. If Palier’s assumption, that Th.Victor went to live with Marmé in Cleves, is correct, then his instruction ended at the latest in 1757, but probably earlier, as the seal he made in that year for alderman Daniel Velters would attest. After this, the young engraver produced many more seals. 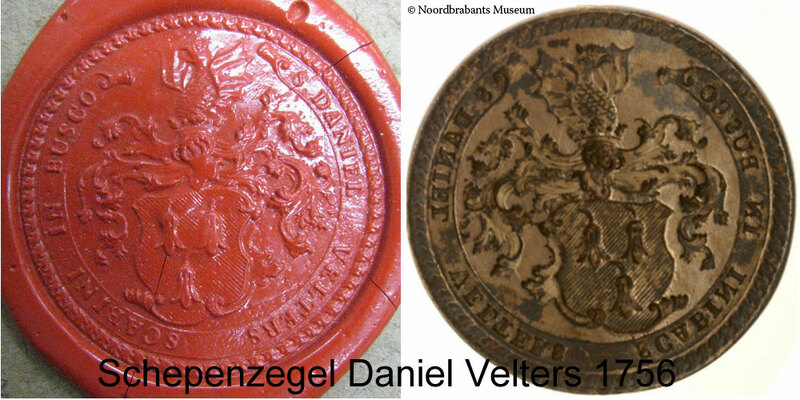 A seal of Daniel Velters, alderman of 's-Hertogenbosch, made in 1757 by Theodore van Berckel. Photo: L. Lennaerts/ stadsarchief 's-Hertogenbosch/Noordbrabants Museum. 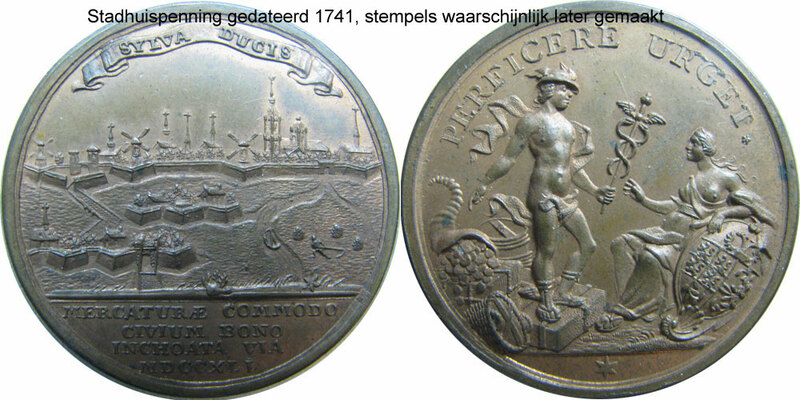 Marmé produced various dies for the city hall medals dated 1741 for Den Bosch, for the account of van Berckel senior. 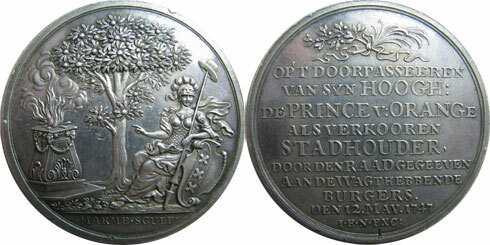 The subject for the medals was the construction of the thoroughfare between 's-Hertogenbosch and Eindhoven. The dies were heavily pressured in the striking of the medals and often broke. There are therefore many variants known of this type of medal, as broken dies had to be replaced a number of times. Characteristics in style identify the hand of the young Theordoor van Berckel. He produced these dies, in all probability, sometime between 1755 and 1760.